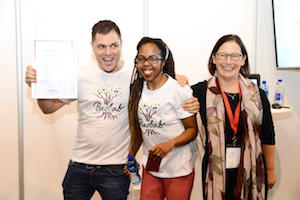 The Hague Institute for Innovation of Law (HiiL) is pleased to announce Baobab.law as the Southern Africa winner of its annual Innovating Justice Challenge. The winner was decided at a special pitching event on Tuesday 4 September at Sandton Convention Centre, by a panel of expert judges from the fields of law and innovation. Baobab.law was founded by Khokela Daula and Guy Stern, and seeks to remove barriers to entry for legal assistance by providing information DIY legal solutions in the form of video tutorials that can speed up process of resolving legal matters. Videos are recorded with professional lawyers and available in multiple local languages.